If you’re in the recruiting industry, you know that success is dependent upon building strong relationships with a network of talent. 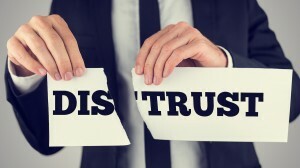 There is much involved in finding and attracting top performers who are the right fit for the positions you have to fill, but above all else, the ability to build trust is key. It doesn’t take long for word to get out about a recruiter who is dishonest or disrespectful, or who makes promises that he or she can’t keep. Today’s job seekers are savvy and more connected than past generations, thanks to social media. They’re also cynical, having lived through a tough economic recession and even tougher job market. It’s quite possible that they were victims of downsizing or layoffs, or worked for employers that did not care much for work/life balance. There’s also the likelihood that you’ll be contacting some prospective talent who are currently employed, and therefore not actively looking for a new job. In other words, it’s up to you to convince your talent pool that working with you is in their best interest and worth their time. The best job prospects want to work with recruiters who understand not only their career aspirations, but also their rights as job seekers. By being transparent and communicating your goals clearly, you can help reassure your candidates that, even though you’re working on behalf of employers, you care about their interests, too. Being a strong recruiter means that you respect the professionals with whom you connect enough to be honest about the details of the open position. It also means that you’re realistic and understand that the job seeker is exploring many avenues in order to find employment. That means you won’t be upset if you find out they are entertaining other offers or working with multiple recruiters. Another thing to keep in mind is that you should never make assumptions for the job seeker — always check in with them before you send out their resume. Finally, you have to leave some room for negotiation, since top talent will usually not accept the first offer you present to them. Ideally, you should aim to work with job candidates who fully understand their rights as job seekers so that there are no misunderstandings, and you can feel confident when you introduce them to your hiring clients. Take a look at the infographic below this paragraph. 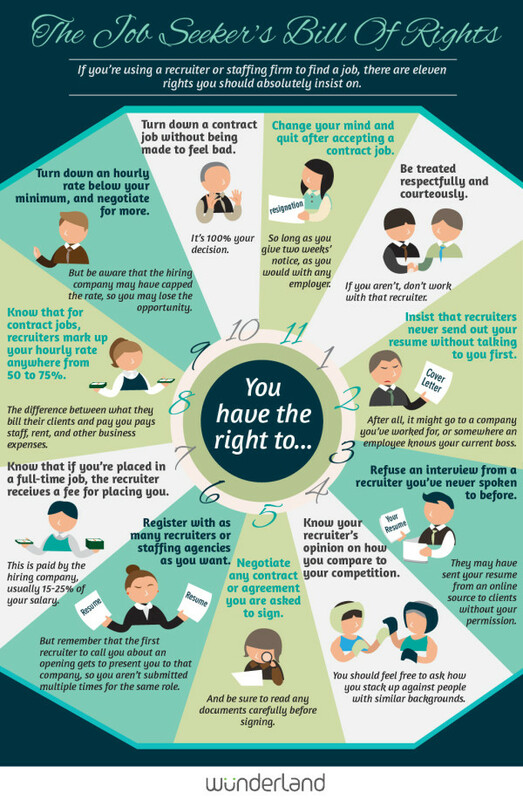 It was compiled by WunderLand, and it outlines the “Job Seeker’s Bill of Rights.” Ask yourself if you’ve been mindful of these rights. You should also share them with new candidates so they know that you care about their needs. By putting yourself in the job hunter’s shoes and taking care to pair him or her with the right opportunities — not just any position that comes along — you’ll be on your way to a better success rate.